Viewing hours are Saturdays 12–4pm or by request at info@topazarts.org. 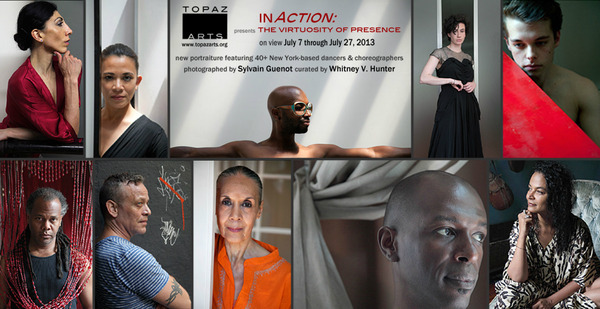 TOPAZ ARTS presents inAction: the Virtuosity of Presence – an exhibition of new portraiture featuring 40+ New York-based choreographers and dancers created by portrait photographer Sylvain Guenot, curated by Whitney V. Hunter. inAction: the Virtuosity of Presence is a collection of portraits of dancers from the well-established professional to the emerging artist. Presented at TOPAZ ARTS, this exhibition is conceived and created by UK-based portrait photographer Sylvain Guenot and curator Whitney Hunter, in collaboration with 40+ dancers & choreographers photographed. A cross-section of the diverse NYC dance community, the portraits were gathered through the network of dance artists during two recent visits to New York. Rather than photographing the dancers in performance, images of the artists were taken in private environments, taking great care in using minimal external elements as subtle tools for composition and artistic insight. Focusing solely on the presence of the dancer, this new series of large-format prints offers the viewer a window into the heart and mind of the artist.